Explore ten gross motor activities for autistic children that can strengthen muscles while developing valuable skills. Many choices are readily available for parents and professionals working on meeting gross motor goals in a child's treatment plan. Some activities are challenging while others are pure fun. The ten gross motor activities for autistic children include activities that improve social skills while improving gross motor development. Marching is a simple gross motor activity that can develop a number of different skills. The task takes walking one step further as children have to imitate the steps. 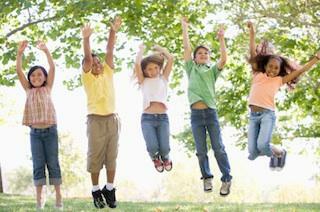 Encourage the child to begin with the leg movements in place, followed by stepping and arm movements. A trampoline is the king of gross motor activities for kids with autism. The bouncing motion offers excellent sensory input that can be very helpful in alleviating sensory overload and anxiety in many cases. Some children may demonstrate fewer repetitive movements after engaging in the jumping activity and it can help some kids to calm and organize their behavior. Balancing can be very challenging for kids on the autism spectrum and many gross motor tasks demand a good sense of balance. Test to see if your child can stand motionless with her eyes closed without losing balance to gauge how much work is necessary to develop balancing skills.Begin with having your child walk on a line followed by walking on balance beams. 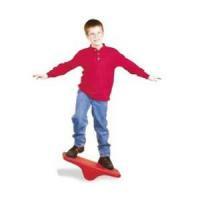 Balancing toys like a rocking see saw can improve skills. Try a see-saw for balance. Bikes for autistic children don't have to be made especially for kids on the autism spectrum, but some augmented bikes can benefit many. Tricycles and bicycles can help develop balance as well as leg muscles. The task requires the ability to move while focusing on where the bike is going, which can be challenging. Few things are as impressive as a simple cardboard box when it comes to creating fun activities for children. Encourage your child to step in and out of short box as a beginning task. Gradually make the tasks more challenging by creating step patterns and by using deeper boxes. Crawling through a tunnel can be an extremely enjoyable activity as the child uses motor skills while developing a sense of object permanence. Incorporate social skills into the activity using peek-a-boo, hide-and-seek, and pretend play. You don't have to buy a tunnel toy to enjoy the crawling activity. Align boxes to create a tunnel or build one using chairs and blankets. The tunnel activity can be transformed into different things, from a train to a campsite. Obstacle course stations offer an opportunity to use different gross motor tasks and they can be excellent sequencing activities for kids. The activity is a great way to reach treatment plan goals that involve following directions. Movement activities can be a source of anxiety for many kids on the spectrum. Offer guidance and support by introducing activities gradually. Begin with the least threatening tasks followed by tasks that are more challenging and make sure that the activities you introduce are appropriate to your child's developmental level to ensure that the target motor skills are realistic.